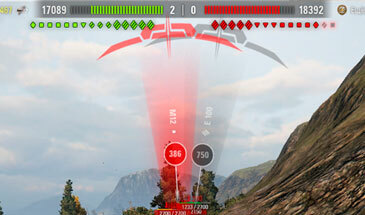 Damage Indicator “Predator” for World of Tanks 0.9.19.1.1 show you the direction from which was the fire on you. It made in red semicircle with irregularities and the central index, which helps you more accurately determine where you are shooting on. Because of its color well marked on any maps. Compatible with the new update 0.9.19.1.1. Important! To operate an extended time display modes damage indicator in the game settings must be enabled in advanced fire indicator.